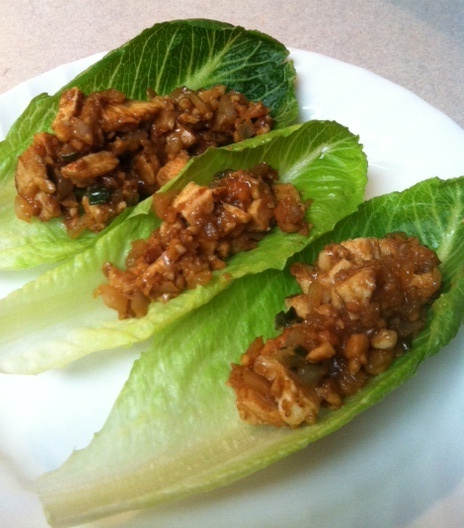 Here is a simple and quick recipe for some yummy Asian Lettuce Tacos. I love using lettuce as taco shells because it gets more greens into my diet and less simple carbs. Plus you can make the filling ahead of time and put in fridge and just heat up what ever night you choose to have these tacos! I bought the shells at Costco. They are the Artisan Romaine. They are littler than a butter leaf but I actually like it that way. Great for portion control and I don’t like it when it’s all lettuce in my bite. I also used Wok Mei brand for the Hoisin sauce. It says it’s all natural but I don’t like the caramel color they add in there so I’m going to make it from scratch next time, but this was the only brand that I found that didn’t have a whole bunch of extra stuff (crap) in there where I was at. Rinse and dry the leaves, becareful not to tear them. Add the grapeseed oil and the chopped onion into a medium skillet over medium-high heat and stir frequently, about 1 minute. Add the garlic, tamari, hoisin sauce, ginger, and rice vinegar to the onions and stir, about 1 minute. Stir in the peanuts, onions, sesame oil, and cooked chicken and continue cooking until the onions just begin to wilt, about 2 minutes. Remove from heat and put into a bowl and spoon portions into each shell.